Home Beers Budějovický Budvar, n.p. Budweiser Budvar B:Original | Budějovický Budvar, n.p. Exported to the US as Czechvar. Czechvar is the special name of the world famous beer produced by renowned brewery in České Budějovice, Czech Republic. Benefitting from over 700 years of brewing experience of the South Bohemian region, Czechvar is the golden original, acknowledged by many connoisseurs as one the best lagers in the world. A- This pours a very clear golden color with an initial one finger thick head, however, this dissipates very quickly. Carbonation seems to be reasonable and unassuming, which is different from the imposter Bud we think of as the original. Lacing is actually not bad, as small patches of foam cling to the side of the glass. S- The aromas are floral, and full of malt, which is nice by comparison to what I was expecting. There is a distinct hop petal bitterness but its smooth and not in your face.....the malt is syrupy and somewhat honeyed....really nice and a very decent smelling Euro lager! M/O- For sure this is a summer time lager that is stupid easy to drink and drink some more! It is medium bodied, creamy and dare I say flabby?! Carbonation is fairly robust and the alcohol is hidden well.....would I drink this again...yeah, and do I think it's better than AB Bud....Yes! However, I would most definitely pick another Czech lager over this one....still, its good! This beer was so good that a certain American Brewer stole its name. It is light, clean and crisp with light grain flavors. Straw gold, effervescent with a crisp hop accent. With a golden color, it has a very, very musty aroma, possibly due to the distance traveled from the Czech Republic and the pasteurization requirements for imports to the US, but the taste is fresh, crisp cereal malt with a carbonating sting of grassy hops. The hops may or may not fit well with the malt, but it also has a creamy aftertaste that is very enjoyable. Although this style isn’t my forte, this tastes like one of THE best pilsners around, especially when enjoyed in the country it came from. This is the original Budweiser, straight from České Budějovice in the Czech Republic. Czechvar is the American iteration of the original Budejovice/Budweiser Budvar. As per American import regulations it has been pasteurized, which affects the quality. In the Czech Republic, it is sold as Budvar. It is a light, clear gold with an effervescent whit head that doesn't stick around too long. Flowery, fruity smells coupled with a grainy taste. Better than American mass market brands, but not as good as back in the homeland. Sold in Sweden as “Budějovický Budvar B:Original”. The colour is pale gold; the liquid is clear. The finger thick head (I have had several bottles of this one, all with surprisingly low head) is white and airy, it sinks down to a thin lid leaving no lacing. The smell is floral and buttery with some white bread and a touch of marzipan. The taste is smooth with passing notes of butter, fresh flowers, sourdough wheat bread and a touch of caramel cookies. Medium body. The aftertaste brings clean bitterness, tree sap, more bread and some fine butter. Dry floral notes in the finish. The carbonation is fresh, the many bubbles are mid-sized and long-lived. The liquid is semi-smooth. A well-crafted classic Czech pils with more focus on the hops than the malts. Very drinkable. Clear golden yellow with a thin white head that mostly disappeared rather quickly, but left bits of lace on the glass. Strong aroma of noble hops, quite crisp. Medium bodied with fairly high carbonation. Hop bitterness shines through from beginning to end, with some spiciness at the finish. Smooth and well-balanced with a nice finish. Pretty much everything great about a Czech beer. High drinkable, very refreshing and very crisp. Finishes slightly hoppy/bitter, but not so much that you don't want to have another. You can smell and taste the hops but they are balanced nicely by the maltiness of this beer. I prefer it to Urquel, but you can't go wrong with either. Nice change of pace beer for a back year barbecue. Rumor on the street is AB is going to gobble this one up. Oh well. This one poured with a nice little white head and some lace. Mildly hoppy bitter beery aroma. Good yellow gold color. Very nice pilsner qualities. Think I pick up a little corn in there though. Definitely a session beer. Crisp, clean, bittersweet. Finishes the same way. Copper like lager colour, average head that fades quickly. 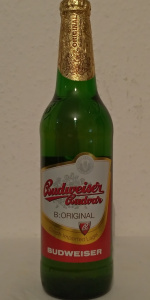 I'm reviewing this bottle in the UK, and this one is ok, but Budvar appears to be a little hit and miss here. This is because many shops sell this beer out of code, which makes it flat and foul tasting. Anyway, the carbonation is present and not overally visible - nicely balanced. Slightly sweet / flowery / fresh taste, the way I like it. Also lacking bitterness, which I prefer. Overall, a drinkable, pleasant tasting beer, but may be vulnerable to light / expiry date problems. Pours a vigorous, thin head. Even gold in colour. No lacing to speak of. Appears almost flat. Good balance between malt and hops on the nose. I can taste the allusion to the big brewery product of my high school days (bitter beans anyone? ), but it's only an initial illusion at that - there's a lot more here. The bitterness gives way to some sweetness. Positively sweet. The malt comes through more towards the end and leaves me with an even, balanced mouthfeel. The carbonation is hidden here by the look but it's there and it's pleasant. I could do a couple bottles of this stuff, it's not heavy. Very quenching and would be a good patio quaff. Leaves me wanting more. Czechvar pours a clear, golden color. A 1/4" off-white head forms and fades fast. Moderate carbonation; little lacing. The malty sweetness in the aroma is balanced very well with the citrus and mild pine aromas from the hops. A faint apple smell can also be found. The inital taste is quite sweet; the malt flavor is very evident. Right after that, the hops kick in, providing a bitterness that complements the malt quite nicely. The taste is what one would expect from a good pilsener: simple and uncomplicated, yet executed very well. The mouthfeel is thin (as would be expected for a pils); however, the finish is exceptionally crisp. The residual bitterness left by the hops is mild and pleasant. I've never had a Czech lager before, and the difference between it and American macro lagers is very evident. This is a great example of what a real pilsener is, and how much it has been corrupted by megabreweries throughout the world. Very bright and clear, the head forms thick and fast, but disappears pretty quickly, leaving nearly no traces of itself on the glass. It smells pretty good! Much like many other similar beers. The taste is fine. I prefer it to many similar ones, although it may not be my favourite. A bit fruity. It feels fine in the mouth... a bit over-carbonated, perhaps. As for drinkability, it's fine. It'd be easy to put a couple of these down if they were handy. Budweiser Budvar B:Original from Budějovický Budvar, n.p.